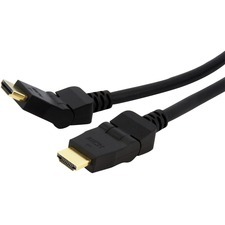 Tripp Lite's 50ft, HDMI (High Definition Multimedia Interface) cable allows interconnection between digital display devices, such as DTVs (digital television), Plasma displays, LCD TVs, and projectors, to digital source devices. Use Plenum rated cables where local fire codes call for a fire resistant cable, such as schools, commercial buildings, etc. 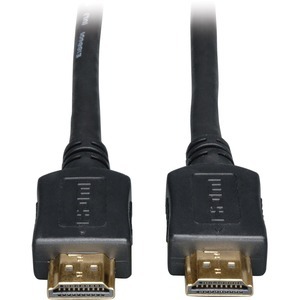 HDMI assures that the best video signal is always sent from source (HDTV signal, DVD player) to the display. It does this by allowing uncompressed video and multi-channel audio data to be input to the display device through one single cable. The need for multiple analog connections for high-resolution audio and video are eliminated. 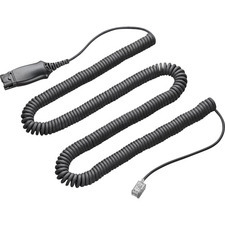 Without a HDMI connection, one would need three video connections for high definition video and six audio connections for high-resolution audio.